Founded in 1994 and headquartered in Dallas, Texas, Wingstop is an award-winning, top-ranked national fast-casual chicken wing chain. For two decades, Wingstop has been saucing and tossing fresh, made-to-order wings. 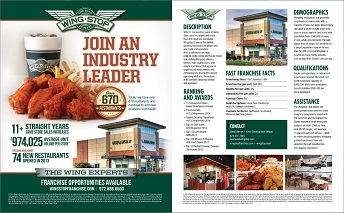 With 11 consecutive years of same store sales increases and more than 675+ locations open across the United States, Mexico, Russia and Singapore, Wingstop is one of the fastest growing franchises for single-unit and multi-unit operators. Maintaining a sole focus on fresh, cooked-to-order wings and house-made side dishes, Wingstop offers a limited, high-quality menu with simple operations that appeal to experienced restaurateurs and entrepreneurs. Due to this simple operating platform, the system is 95 percent franchise owned and operated.